Today more than ever it is critical to guide future teachers in the direction of understanding how people participate and constitute social reality as a seedbed to create more significant language currículums that respond to school students’ needs and empower them to act more critically in their worlds. This article discusses the way pre-service teachers started to become aware of the need to establish relationships between community resources (linguistic, social, and cultural) and their role as individuals and teachers to enact critical pedagogy. This qualitative exploration was developed with three different groups of students in an English undergraduate program in a public university. Data were gathered by means of community mapping reports (Kreztmann & Mckinght, 1993) and presentations, students’ insights into community based pedagogy in teacher education (Schecter, Solomon, & Kittmer, 2003), and pedagogical projects designed and carried out in the schools where they did the teaching practicum. The outcomes of this study brought to light how pre-service began making connections between the principles of community based pedagogy and the language curriculum in the schools. Findings demonstrate the way they encouraged their students to explore their communities from different perspectives and promoted students’ role of inquirers of themselves and their contexts. Hoy más que nunca es fundamental guiar a los futuros docentes en la comprensión de cómo las personas participan y constituyen la realidad social como semillero para crear currículos de lenguaje más significativos que respondan a las necesidades de los estudiantes y los empoderen para actuar de manera más crítica en los mundos que están inmersos. Este artículo muestra la forma en la que los docentes en formación comenzaron a tomar conciencia de la necesidad de establecer relaciones entre los recursos de la comunidad (lingüísticos, sociales y culturales) y su papel como individuos y docentes para implementar una pedagogía crítica. Esta exploración cualitativa se desarrolló con tres diferentes grupos de estudiantes de un programa de pregrado en inglés de una universidad pública. Los datos fueron recopilados por medio de informes de mapeo comunitario (Kreztmann y Mckinght, 1993) y presentaciones, perspectivas de los estudiantes sobre la pedagogía basada en la comunidad en la formación docente (Schecter, Solomon y Kittmer, 2003) y proyectos pedagógicos diseñados y llevados a cabo en las escuelas donde hicieron la práctica de enseñanza. 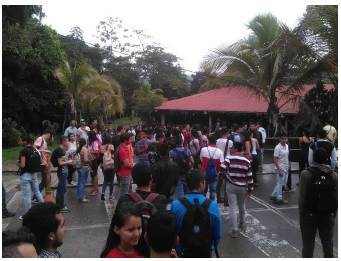 Los resultados de este estudio revelaron cómo los estudiantes-docentes comienzan a establecer conexiones entre los principios de la comunidad y el plan de estudios de idiomas en los colegios. Los vínculos iniciales muestran la forma en que motivaron a sus estudiantes a explorar sus comunidades desde diferentes perspectivas y promovieron el papel de exploradores de sus propios contextos.en los estudiantes. Language teacher education programs not only have the responsibility of guaranteeing the linguistic and pedagogical development of our pre-service teachers, but also the social commitment of helping them become critical readers of their society and agents of social transformation. As Freire (2005) states, in order to engage social transformation, our learners need to realize that they are makers of culture and they are owners of reading and writing, able to read their realities. Achieving this endeavour requires pedagogies that take our learners right to their realities and surroundings. As such community based pedagogy becomes a significant framework through which our pre-service teachers can see their communities as spaces that offer rich sources to connect their syllabus and programs with the social, cultural, and economic areas that are part of the life of students and at the same time linked to language development. In this sense, this article illustrates the ways in which pre-service teachers became aware of the need to establish connections between community resources (linguistic, social, and cultural) and their role as individuals and teachers to enact critical pedagogy. To accomplish this task, the initial steps are reported of student-teachers in the direction of being acquainted with and taking action based on community based perspectives. The findings become a springboard that enhance further research and curriculum adjustments in university courses in order to continue exploring the possibilities in the language classroom while allowing us to see a major impact in community inclusion, awareness, and understanding. This article provides an account of studies on community based pedagogies (Moll, Amanti, Neff, & Gonzalez, 1992; Sharkey & Clavijo-Olarte, 2012; Warburton & Martin 1999), funds of knowledge, local knowledge (Genzuk, 1999; Moll et al., 1992; Warburton & Martin, 1999), the community teacher (Schecter, Solomon, & Kittmer, 2003), and language teaching education (Murrel, 2001). These trends are strongly related to both future language teacher education and also going beyond the structural curriculum to provoke permanent meaningful learning. In addition, these trends are of paramount importance to determine how much the existing knowledge of community beased pedagogies, funds of knowledge, local knowledge and the community teacher lead preservice teachers to a clear-cut prediction of the way they carry out their classes using their own as well as natural resourses to focus day to day school practices. The term community is defined by dictionary. com as “a group of people living in the same place or having a particular characteristic in common, or a locality inhabited by such group.” A community in the particular case of this article is the place, the neighborhood, or the block where students belong or live together, share ideas, preferences, buy, sell, or play. The community is a vital part of the teaching and learning process as well as a fund of knowledge (Moll et al., 1992). Similarly, the connection between the knowldege, the practices, and the curriculum are under the consideration and appreciation of the community in which schools are located and students and their families inhabit. (Sharkey & Clavijo-Olarte, 2012). Community based pedagogy (CBP) involves the knowledge of the local communities, beliefs, constructs, and perceptions that all the people who belong to that community hold and share through everyday contact. According to Warburton and Martin (1999), “CBP includes the way people observe and measure their surroundings, how they solve problems and validate new information, the processes whereby knowledge is generated, stored, applied and transmitted to others” (p. 1). In Sharky and Clavijo-Olarte’s (2012) perspective, CBPs are curriculum and practices that reflect knowledge and appreciation of the communities in which schools are located and students and their families inhabit. This methodology offers the opportunity to encourage future language teachers to connect theory and practice and to focus on self-directedness and self-awareness. Understanding the implications of these approaches, and making decisions about how to appreciate the sources that the communities offer, becomes a challenge for this new teachers generation. At this point Genzuk (1999) established that “the community funds of knowledge utilizes the notion of assisted performance, what a child can do with help, with the support of the environment, the others, and of the self” (p. 9). In this way, former teachers have the urgent need to prepare future language teachers to be conscious and aware of what they are learning to make informed decisions about their own learning (Sinclair, McGrath, & Lamb, 1999). Local knowledge is a collection of facts and relates to the entire system of concepts, beliefs, and perceptions that people hold about the world around them. Operationally, this refers to “the way that people observe and measure their surroundings, how they solve problems, and validate new information. It includes the processes whereby knowledge is generated, stored, applied and transmitted to others” (FAO, 2004, n.p.). In this respect, Genzuk (1999) states that “a review of the literature suggests that to be an effective teacher, you need an in depth knowledge of the subject matter, a repertoire of teaching strategies and a deep knowledge o the culture and history of the students you are teaching” (p. 11). The term community teacher refers to any teacher who teaches any area of knowledge but whose central point or resources of teaching is the community. In this respect, Murrel (2001) affirms that “a community teacher possesses contextualized knowledge of the culture, community, and identity of the children and families he/she serves and draws on this knowledge to create core teaching practices necessary for effectiveness in diverse settings” (p. 51). Community-situated pedagogies posits community as a curriculum resource and challenges to design and implement pedagogies based on community knowledge (Schecter, Solomon, & Kittmer, 2003). Basic concepts related to the tendencies of working with the community are core issues in language teacher education. That is due, in part, to the fact that teaching and learning are understood as social activities which guide teachers to consolidate the relationship between the profession of teaching and the role of the community in the learning experience. Teachers have understood that the tasks of teaching and learning imply making curriculum modifications to include all funds of knowledge provided by families and communities around the school. In addition, through teaching, the teacher becomes an investigator of challenging situations to help their students and impact the community. Research helps teachers to innovate and make contributions to the school curriculum. On the other hand, Murrell (2001) highliths the importance of supporting teaching-learning activities with a community-based practice and argues that an accomplished teacher “possesses and works to build on knowledge of culture, community, and identity of children and families as the core of his/ her teaching practice” (p. 2). Exploring pre-service teachers understanding and incorporation of knowledge of local communities in language teaching and learning motivated us to rely on a qualitative exploratory design. This allowed us to explore explanations, words, concepts, and realities with the expectation of offering new ways of seeing and perceiving how these realities were constructed. In other words, exploratory research provided us the possibility to make sense of the world, offering new approaches and angles to find new alternatives (Reiter, 2017). By observing and analyzing realities from surrounding contexts and communities as well as from different angles, we sought to go deeper and unveil the pre-service teachers’ perceptions of the local resources available in their communities and how they characterized their own role as teachers as they explored their communities. Additionally, we sought to describe the ways in which pre-service teachers become aware of the need to establish relationships between the community resources (linguistic, social and cultural) and their role as individuals and teachers to enact critical pedagogy. As such, we address the following research question: How do EFL teachers in university-based education programs understand and incorporate knowledge of local communities as resources for language teaching and learning? Universidad del Tolima, the only public university of the region, holds approximately 19,000 students and offers 27 academic programs. The School of Education is one of the biggest academic units of the institution, which in turn is constituted by six undergraduate programs such as social studies, science, mathematics, Spanish, physical education, and English-the focus of our study. Fifty-six participants enrolled in this ongoing study from three different courses: Research Seminar I, didactics I and Practicum III. The participants were pre-service teachers from sixth, seventh, and tenth semester respectively of the undergraduate program in English. Practicum III students are in the last semester of the program and in the final stage of their practicum process. They have completed two research seminars and two didactics courses, and most of them are already working as part time teachers at different language centers within the city. Participants started the process reading about some experiences of teachers at public institutions related to community based pedagogies. After discussing in class and becoming familiar with the Community based pedagogy as an eye-opening for pre-service teachers' initial connections with the school curriculum principles and foundational bases of the framework, they did an initial exploration of the university community in order to identify and analyze assets and realities while experiencing the process of mapping the community as one of the moments of this framework. Thereafter, the discussion took place in class as a result of sharing their findings and reactions to what they could observe. Students explored the university community as a source for their curricular construction and experienced the possibilities of making curricular connections related to language teaching and learning. As a conclusive stage, students had the opportunity to write a narrative in which they talked about the experience and the most significant insights that they had gained. Several of the Practicum III students decided to follow the community based pedagogy framework in their own teaching practice since they had to choose the framework or design they preferred in order to carry out a small-scale research project as a requirement of the course. In this way, five practicum students developed significant projects based on the local community. Students’ reports of their mapping exercise and photographic evidence: Students presented their findings orally and then shared their perceptions from the exercise and of what they identified within the community. Students’ narratives: Once students finished the process of mapping the community and after having the sharing and discussion time in class, they wrote a narrative about their feelings, insights, and more significant lessons from the experience. Practicum III students also wrote about their projects and what they were able to draw from the implementation of the community based pedagogy. Practicum students’ projects and oral and written reports of the progress and development of the project: students planned and carried out community-based projects throughout their practicum and shared the final results and conclusions in a local event held by the B.A. 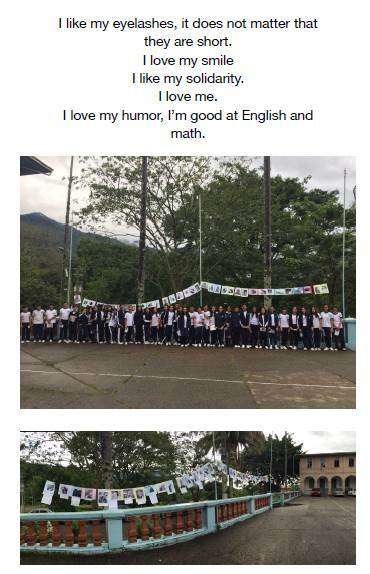 in English program. In this event, students shared their findings and the process they lived when implementing community pedagogy. Interviews with cooperating teachers from public schools in which the students completed their practicum. We decided to interview these teachers in order to inquire as to their perceptions of the projects that pre-service teachers developed and their insights in terms of teaching and learning. From the very beginning of the process students who participated in the project authorized the use of the information provided through the data collection instruments and agreed to participate in the study. They were aware in advance the objectives and the general dynamic of the study. To analyze our data, we used grounded theory which allows the data to bring to surface significant results of the implementations done in three different courses. The exploration of assets at the university, the students’ papers, and the outcomes of practicum projects were read several times as we used color coding to identify recurrent patterns and themes in the different instruments applied in the courses. The individual analysis of the instruments was compared and contrasted to triangulate and verify the findings. The themes that came into view led to categories that became evident after the analysis. These themes included: raising CBP awareness in language teacher preparation courses, understanding what a community teacher is, and community oriented practices as a path for pre-service teachers reinvention of the language curriculum. The three categories explain the different phases undertaken in this study such as (a) the way students were familiarized with community based pedagogy principles and procedures; (b) The initial interpretations and understandings of the preservice teachers with respect to their role as teachers and individuals; and (c) what the implementations in the teaching practicum revealed pertaining to curricular innovations and new perspectives about language teaching when community members come to the center of decision making and social agency. After analyzing the data and determining the three categories, we as researchers realized that the findings revealed a sequence and an implicit process of community based pedagogy understanding and implementation. The two first categories revealed how CBP was eye-opening in terms of raising awareness and unveiling more significant teachers’ roles and a sense as individuals. These issues were strongly evident in students from the Research Seminar and the Didactics course. The third category, which deals with the curricular connections between CBP and the curriculum, was evident in students from practicum III who could implement and reflect on their practice. This important outcome encouraged us to start thinking about connections among the courses in order to establish a sequential process when exploring and implementing community based pedagogy. One of the main challenges of language teacher educators is to guide future language teachers to be independent while focusing them towards self- directiveness and self-awareness. Throughout the day-to-day training, preservice teachers learn the theoretical foundations on how to be successful in their profession, but it is through practice that they experience the dynamics of the classroom, to know and understand their students and the different pedagogies to meet the student’s needs. Additionally, raising future language teachers’ awareness has been a matter of proving different pedagogies, strategies, and resources which helped them not only to be informed about new pedagogical and didactic trends, but also to put hands to work driving the preservice teachers to search within and include the communities, funds of knowledge, and the local knowledge into the school curriculum and language teacher education. To be aware of the implications of these new approaches and to make decisions about appreciating the sources offered by communities are a challenge for the new preservice teachers generation. Figure 1 Students going to the restaurant. Figure 3 Final products exhibition. “Students constantly complain about the lack of organization when receiving the service, but highlighting the quality and balance of food” (S3). Pre-service teachers also noticed the lack of order at the time of queuing and waiting for their turn in the restaurant. To this respect, one of the students argued, “I had to shout at some students who were disrespecting those who stood in line to be served.” Raising awreness of their community encouraged the pre-service teachers not only to become sensitive to their sorroundings but to expand their views as future teachers. This aspect is discussed further in the following section. As a result of becoming aware of the world outside and all of the resources provided by the university community, pre-service teachers drew significant conceptions about who the teacher is within the CBP framework and they were able to see the possibilities to link community knowledge with their language teaching exercise. Through CBP, the pre-service teachers saw themselves as social agents and arrived at the conclusion that they cannot be outsiders anymore, but as teachers, they need to be part of that educational community in order to be able to understand it and connect it to the classroom. As one of the students states in his narrative about the way he began seeing his/her students, “they are not just someone in the community but they are community” (S4). After getting involved in the community, our students felt they were not external actors but saw themselves as part of it. In this respect a student stated, “we as teachers belong to the community and society, and we are responsible for the warranty of all children and teenagers rights regarding their well-being... It is a moral responsibility” (S5). One more student argued, “CBP allows living the reality of the community where the exercise is being carried out; it is to know an academic world that at a given moment reaches the teacher directly or indirectly as a part of the educational community” (S6). Pre-service teachers understand that the teacher’s role is not tied to a classroom but it goes beyond the walls and the contents they develop in class. Our pre-service teachers see themselves as community teachers and coincide with the description coined by Murell, (2001) who described the community teacher as one who spends quality time in the community where he or she is going to teach in order to better serve his or her students. This vision entails some responsibilities for teachers. First, they need to know the social realities students face every day, and second, they must feel committed to providing solutions and proposals to improve those conditions. In these postings, we observe that CBP works as an eye opener for pre service teachers about their role as teachers. They define themselves as social agents that have the richest resource on their hands; they are able to see the community as a source of knowledge, a source that can provide interaction, opportunities to reflect, and take purposeful actions when necessary. This means that community teachers’ knowledge will be nurtured by reflective experience, cultural knowledge, and critical inquiry (Murrell, 2001). Behind students reflections there is a conception which, perhaps hidden or tacit, is the place of feelings, emotions, and affections in the process of teaching and learning. Almost all the pre-service teachers’ reflections connected their experiences and their role as teachers and their job with appreciation for students, getting closer to their realities, and demonstrating respect and love, among others. In conclusion, we see that for these preservice teachers, the CBP experience moved them to read the community critically, which implies questioning reality, raising awareness, transforming self, and rewriting the world (Medina et al., 2015). From the standpoint that curriculum design and implementation involves decision making requiring a knowledge base which at the same time allows for the connection with the communities involved and the expansion and understanding of them, this category shows pre-service teachers’ experimentations with the incorporation of unused or yet invisible assets such as students’ families or the students’ feelings and perceptions of themselves to promote learning. The scenarios that will be presented highlight how the future teachers began constituting their knowledge base supported by the need to transcend the role of the language teacher and to establish links between daily work and the communities that shape and nurture students’ growth (Schecter, Solomon, & Kitmmer, 2003). This may seem a daunting endeavor when most classrooms, des pite their intended purpose of preparing learners for life outside the classroom,promote insulated practices that do not have reciprocal connections with their outer world (Lave & Wenger 1991; Matus & McCarthy, 2003). In order to promote more constructive experiences that potentiate cultural resources of families and local communities to the benefit of students’ learning, it is paramount to redefine the classroom as a curricular space where the construction of communities of practice (Wenger, 1998) is at the core, where teachers and learners co-construct together and exercise agency to the point the students become cognitively challenged and engaged (Graves, 2008) to work with and within their own communities. As it was described in the forming courses, practicum III students were exposed to the practical work of inquiring about university assets as their immediate community exploration source. The excerpts below show an additional view of the student teachers who in turn start conforming and strengthening their own and growing funds of knowledge as teachers, which will inform them subsequently to make curricular decisions and shape their professional lives. In this regard, the pre-service teachers involved in this exploration and the activities done to raise awareness about the community orientations did not hesitate to express their amazement and revelations of what seemed to them a potential alternative to shape their projects. In this respect, a practicum III student comments “this project will not be focused on teaching just English but it will be focused on teaching them to read and comprehend the world better” (S2). Next there is a description of two different projects and their respective outcomes which display the different curricular connections pre- service teachers started to make between the local sources such as the students themselves and their families. This was evidenced through the design and implementation of a project with impact in the classroom or the school, as a course requirement. Being certain about the nature of their projects framed within the community as a source, it was not enough for the pre-service teachers involved in this study and so they decided to implement a needs analysis that would allow them to focus more acutely on potential areas that they had identified in learners and schools in their former university courses. As a consequence, they started to collect data through questionnaires and informal interviews with the students. This process allowed the teachers to identify the themes of their projects. The following are some of the titles of the projects that pre-service teachers came up with, but due to the teachers’ strike that year, only two of them were able to follow a consistent process and take the project to the end. To provide a detailed account of what the pre-service teacher’s community oriented implementations consisted of, we focus on the following two projects: Valuing the difference and Family structure’s effects on eight grader’s performance from a public school. A first group of preservice teachers wanted to undertake the topic of raising awareness of tolerance and acceptance towards classroom diversity in eight graders at a public school. For them, this was an area of concern which emerged from their own observations and growing concern in the school, where signs of discrimination, exclusion, and bullying were becoming frequent. 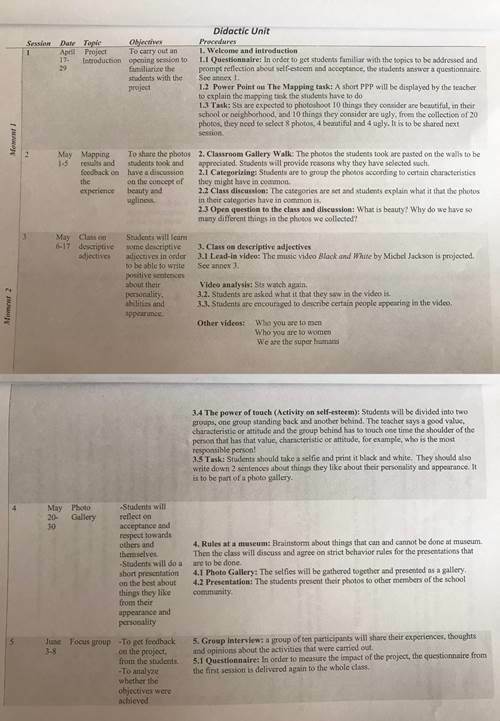 They first implemented questionnaires to dig into students’ feelings about certain issues; in this case, about themselves as human beings with differences. They complemented this information with interviews. 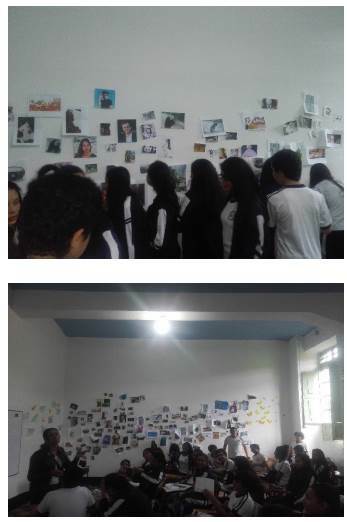 Next, the students took part in a mapping activity in which they exhibited and group photo shoots of their interests, likes, dislikes, and hobbies. By mapping, the preservice teachers could explore students’ concepts related to diversity and beauty and carry out a project that was depicted in a didactic unit (see Appendix 1). One of the salient aspects in this design is the connection of the topic with the syllabus for the course, within the framework of related videos, and self-esteem activities in which the students practiced descriptive adjectives to talk about their personality, abilities, and appearance in different tasks proposed along the project. For this project, there were two major accomplishments as a result of exploring students’ self-value and enhancing respect and tolerance towards diversity in eight graders. The first was an eye-opening experience for the preservice teachers when students became the center of the whole process, and through digging into their needs, perceptions, and views about themselves and about others, opened the door to make sense of, redefine, and redirect the language curriculum as a broader space for learning and growth as human beings. These are some of the reactions that practicum students who directed this project stated in their final written report. Another remarkable accomplishment has to do with the way pre-service teachers and their students see the role of the foreign language in the implementation of community oriented tasks. Their excerpts evidence that the primary goal was not the teaching of the language per se, but it became a means for the students to convey ideas, feelings, and emotions. The following is one of the excerpts from the pre-service teacher who commented proudly on what his students did. The second project conducted by another group of preservice teachers tackled a common issue in different grades in two different institutions which was the influence that different family structures had on eighth graders by portraying their characteristics and fostering ways to involve families more in students’ academic activities. Suleman, Hussain, Akhtar and Khan (2012) suggest that “family setting and background is playing a vital role in strengthening or devastating student’s academic performance. Peaceful and favorable environment within the home has a significant effect on the student’s performance” (p. 235). To begin, these students implemented a needs analysis through a short questionnaire that determined those students with an incomplete family structure. The analysis demonstrated that there were students living with siblings, grandparents, or just one parent. The answers obtained through the implementation of different instruments such as interviews and journal writing on the students’ part were the confirmation of initial analysis and the conclusions which became the gateway to new action plans. The findings out of the three instruments were confirmatory in the sense that they expanded and went beyond the initial information collected through the questionnaires. Regarding the students’ journal, preservice teachers highlighted: “Most of the journals seemed made with dedication and commitment. To be honest, we really loved and were delighted to know the interest of our students in sharing their lives with us” (S6). The didactic unit they designed showed their plan and procedures (see Appendix B). In this plan, the connections are evident that the students made with guidelines set in the country for the schools like the standards and so called DBA. 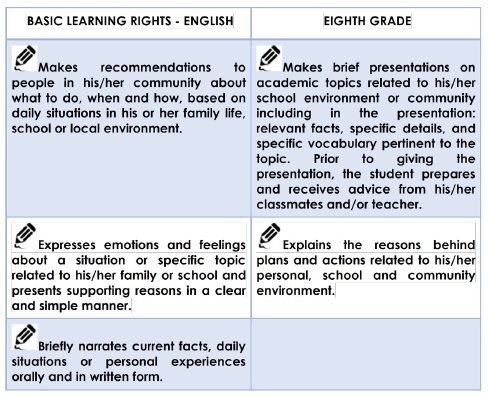 These include basic learning rights that show the link between the foreign language and the chosen topic. The biggest attainments of this project considering its nature are, on the one hand, the reinvention of the English class and curriculum as a space to get a close up to the school students and their family dynamics proved to have a tremendous influence on the students’ performance and learning. This is evidence in the following conclusions that pre-service teachers wrote in their final report. Although the two projects could have gone further and made more evident the role of students as researchers, they made interesting accomplishments and unveiled realities upon which they took action with the purpose of intervening in the areas that were causing problems or difficulties in the students’ learning or academic performance. In this way, it was evidenced that the preservice teachers started shaping a profile as community teachers turning the deficiencies into opportunities (Murrel, 2001). One of the most significant gains for the pre- service teachers at the time of making curricular decisions in connection with the design of community oriented tasks was that they became more sensitive to students’ needs as a starting point in all projects. This allowed them to connect to the personal, cultural, and social influence of the environments that surrounded the school students. This fact reinforced in the future teachers the relevance of addressing needs and interests before they embark in any curricular decisions as they saw students engaged and genuinely active in the different activities proposed. This is supported by Rincón and Clavijo-Olarte’s (2016) who assert that community-based pedagogies are outside school practices, life experiences, and assets that learners and teachers who want to have a deeper understanding of the local places in which their students interact bring into the classroom in order to enlighten class dynamics and curricular constructs. In both projects, the pre-service teachers discovered connections and possibilities to bring communities into the classroom and the curriculum. These connections drove them to innovate the nature of their projects, the role of language teaching, and to included more creative alternatives. Such alternatives brought together the lives of the students and the contexts in which they were immersed as it was clear in the didactic units they designed without following a course book or rigid curricular agendas. In this regard, Sharkey (2012) affirms that “curriculum can come from the interaction between student, teachers and experiences; it does not have to come from a textbook or in a box of materials from the district office” (p. 12). The two projects also made noticeable the role of the language teacher and the role of the teacher- researcher of their communities, which is an area that needs further encouragement in teacher education programs as a way to foster substantial impact in classroom and teaching practices in general. Through continuous and extensive exposure to the implementation of this type of pedagogical orientations in the teaching practicum courses, the role of the researcher will be very likely passed on to the school learners, too, with meaningful results. As we walked the path with our pre-service teachers, we realized that the concept funds of knowledge also applies to the knowledge base of future teachers since their histories and former experiences guide and shape the decisions they make in their teaching practices and hopefully later in their professional lives. It is necessary to continue in the exploration of community responsive pedagogies with pre-service teachers. Research has shown that many teacher education programs pay little attention to the differences among preservice teachers’ experiences, cultural backgrounds, and needs, and to how the valuable resources they are for learning in their teacher education courses (Gupta, 2006). As a consequence, this issue becomes a challenge for teacher education programs to incorporate pre-service teachers’ experiences, interests, concerns, social awareness, and the community they represent in the process of becoming a teacher. The first encounters of the pre-service teachers with this perspective reinforced their sensitivity to their students’ needs and opened the door to new possibilities and new ways of seeing their learners, their families, and the environment that surrounds them. It let them see and employ other forms of working with and for the curriculum as vehicles that should facilitate social network that bring “living knowledge” from the community to the classroom (Moll, 1992). This experience also demonstrated the need to develop extensive foundational knowledge in the pre-service teachers regarding social, psychological, cultural, political, and economic forces that intervene in students’ lives, to redirect practices as real social agents that take advantage of the potential that community offers to conceive and face the world differently. A final lesson learned is to uphold a more collaborative effort and systematic work between the members involved in teacher preparation during the practicum. This collaboration includes advisor teachers from the schools and the teachers from the university in order to promote sociocultural perspectives such as understanding of community based pedagogies and to enhance more coherent work and eventual growth as team members. Due to school dynamics and university procedures, pre-service teachers were not given enough time to develop their projects as initially planned. During the progression of the project they had to rush and suffer permanent interruptions derived from teachers’ strikes and continuous institutional celebrations. Together, these brought dissatisfaction and frustration on the student teachers’ behalf. It is necessary to look for strategies to work with practicum supervisors at schools in order to make them aware of the procedures and requirements that pre-service teachers have to accomplish during the practicum courses. The imposition of an established curricular agenda at schools constrains the development of pre-service teachers’ agendas. It is necessary to find points of encounter between the two agendas through permanent dialogue and collaborative work. Citation/ Para citar este Artículo: Lastra, S., Durán, N. & Acosta, D. (2018). Community based pedagogy as an eye-opening for pre-service teachers’ initial connections with the school curriculum. Colomb. Appl. Linguistic. J., 20(2), pp. 205-225.